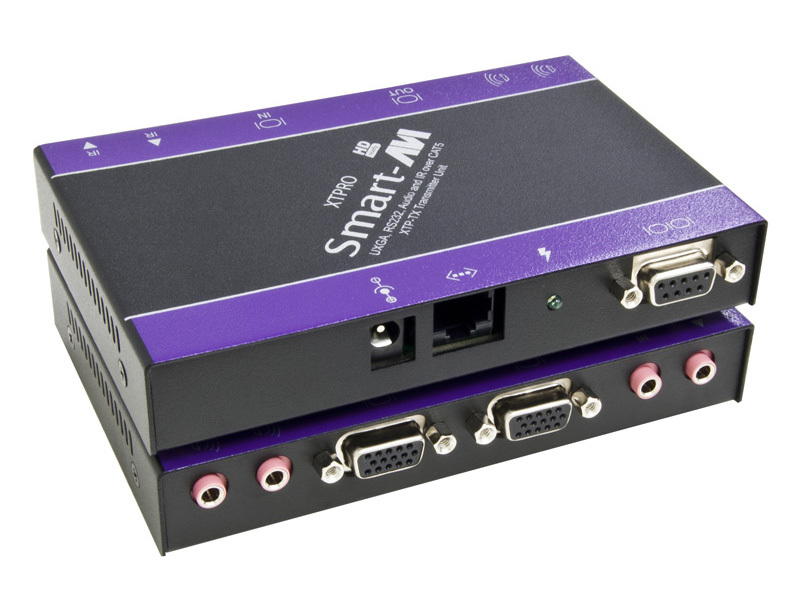 SmartAVI's XTPro is a high resolution UXGA and stereo audio extender system (transmitter and receiver) designed to broadcast desktop video, stereo audio signals, IR and RS-232 up to 1000 feet over unshielded twisted pair (UTP) cabling. Powerful, Cost-Effective Extension Solution The XTPro excels at delivering 1080p (1920x1080) full HD video and stereo audio signals to output devices up to 1000 feet away from a signal source. Better yet, the XTPro is optimized for IR and RS-232 signal extension, as well, so command of distant devices is never out of reach. Cost-conscious users can breathe easy: XTPro is a great value with economical CAT5 cabling, perfect for taking stress off AV signals and wallets alike! A Perfect Fit in Any AV Environment The XTPro excels in a variety of AV environments, like airports, retail stores, schools, hospitals, office buildings, entertainment venues, and more! Presentations The XTPro series enhances any presentation from commercial products to corporate financial data. It can be used in show rooms, board rooms, trade shows and window displays. Data Broadcasting Data such as news, stock prices, sports results, and flight information can be broadcast in real time to various monitors and/or speakers. Learning and Training XT Pro can be used in educational presentations to multiple locations, in schools and in other training facilities.